(Newser) – The Washington Post and Politico have similar stories Tuesday about President Trump, specifically on how aides scramble and strategize to keep his temper in check and limit potentially damaging outbursts. The Post account, based on interviews with 18 people inside and outside the White House, suggests the task has been especially difficult of late and includes a quote already drawing attention. A "Trump confidant" compared the president to a whistling teapot that had the potential to turn into a pressure cooker and explode. “I think we are in pressure cooker territory,” said the source. 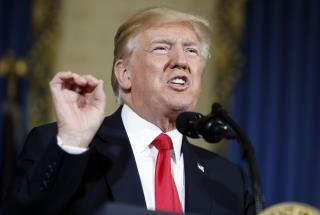 The story takes into account Trump's most recent Twitter tirade against GOP Sen. Bob Corker, who responded with an attack of his own that Trump aides fear might endanger the president's agenda in Congress, particularly on tax reform. This stupid black naive woman will be scratching in places she never thought she had. But that's what happens when you lay with fleas.